Ororo Munroe, A.K.A. Storm, is one of the most famous and powerful mutants on the planet. 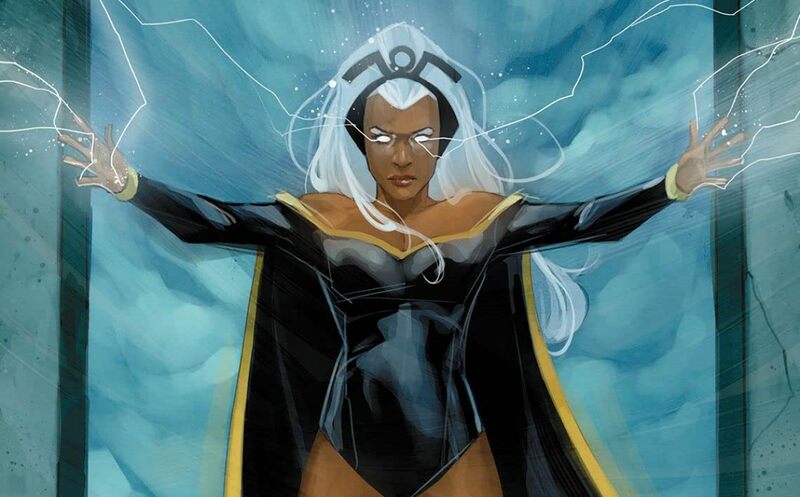 A stalwart member of the X-Men with the ability to control the elements, Storm has also been worshipped as a goddess, Queen of Wakanda, and as a member of both the Avengers and the Fantastic Four. She is one of the X-Men’s most senior leaders. Professor X recruits Storm along with an international assemblage of X-Men to join Cyclops on a mission to rescue the original team! Their operation is a success, and the monstrous living island Krakoa falls before their combined mutant might! Confined in Cassidy Keep, Storm reflects on her childhood and the root of her deep-seated fears. As a young girl in Egypt, a missile killed Ororo’s parents. Trapped with their bodies in the ruins of her home, she developed an intense fear of enclosed spaces. Orphaned in Cairo, she became an expert pickpocket and thief, before she journeyed to her mother’s native Kenya where she was revered as a goddess! Callisto, leader of the subterranean society of mutants known as the Morlocks, kidnaps Angel to force him to be her groom! Storm leads the X-Men underground to rescue their teammate, but they become locked in pitched combat with the Morlocks. To settle things once and for all, Storm accepts Callisto’s challenge for a duel to the death to determine who will lead the Morlocks! The X-Men are in Japan to attend the wedding of Wolverine and Mariko Yashida. Storm and the young, free-spirited mutant Yukio are separated from the X-Men. A group of muggers assaults the pair, and Storm is impressed by how Yukio embraces her emotions as opposed to Storm, who must always keep herself in check. This inspires Ororo to take on a new look: black leather and a punk rock Mohawk! Storm chases after a runaway Rogue, and after catching up to her tries to help her accept her powers for both better and worse. However, government agents ambush them, with the goal of using a depowering weapon against Rogue due to her criminal past. Storm is hit instead, and loses her powers! Read through #186 for the famed Lifedeath story! While visiting Asgard, Loki meets Storm, who is still forlorn after the loss of her powers. In an attempt to manipulate her in a plot to gain power in Asgard, Loki grants her the enchanted hammer Stormcaster, which gives Storm the abilities of a Thunder God! With the world needing protection now more than ever, the X-Men split into two teams to safeguard humans and mutants alike. Cyclops heads up the Blue Team, while Storm leads Archangel, Iceman, Colossus, and Jean Grey on the Gold Team! Industry favorite Warren Ellis takes on the Goddess of the Elements! Ororo struggles with guilt and has a too close brush with death in the debut issue of her first limited series! The epic, untold love story between Storm and Black Panther! An orphaned street urchin, living by her wits on the plains of Africa as she struggles to harness her slowly developing powers…a warrior Prince, embarking on his rite of passage as he ponders the responsibility in his future…and a crew of mercenaries who'll stop at nothing to capture a “fabled wind-rider”. What sparks occur when their paths intersect? Civil War ceasefire! The brutal hero-vs.-hero struggle is put on hold as heroes from both sides of the war convene in Wakanda to celebrate the wedding of Storm and Black Panther. Tensions are high, but differences are largely put aside. Plus, they actually get married and no one is left at the altar! As a vampire army descends on San Francisco, the X-Men find themselves in dire straights. The good news is that they may have just discovered a means for stemming the invasion. The bad news? What they need is in the clutches of the vampires themselves. Luckily, the X-Men have two thieves in their employ that may be able pull off such a heist. Hold on to your wooden stakes…Storm and Gambit are in for a bumpy ride! On a mission to foster goodwill and safeguard the mutant race's continued existence in her own way, Storm travels the globe, confronting man and mutant, god and monster and everything in between. She overthrows tyrants, quells tsunamis and strives to see her dream for the world realized. Ororo at her definitive best. The Blue and Gold teams are back! This time however, Storm cedes leadership to her close friend Kitty Pryde. Together they take on a new Brotherhood, deadly Sentinel nano-machines, a Negative Zone god, and of course, a world that hates and fears them!